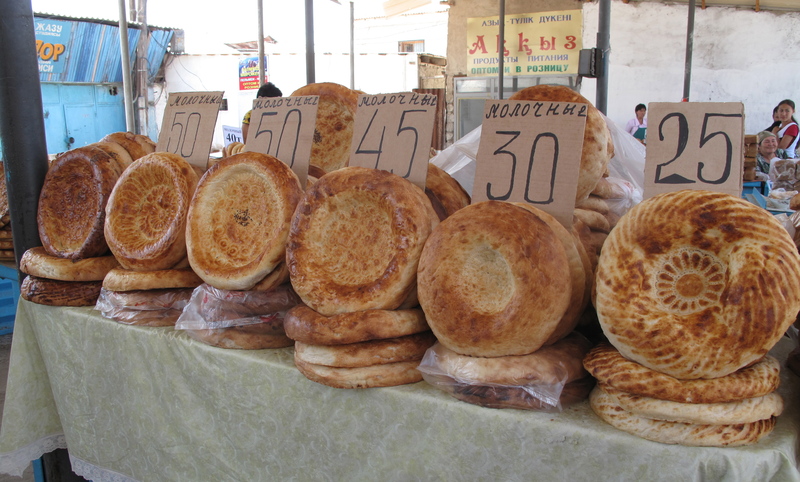 At any market in southern Kazakhstan you will see piles of the most beautiful big round breads, called nan or non. All of them have a raised edge and some kind of decoration on the central dough, though there are many variations on the theme, and they are priced accordingly. 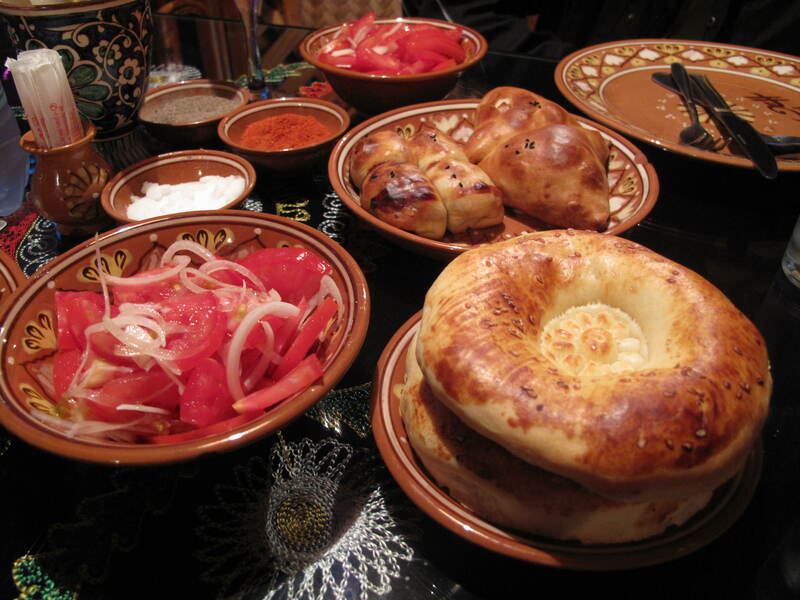 Some are plain (taba nan, or lepeshka in Russian), others enriched with egg (salma nan); some Uzbek-influenced version have fried onion rolled into the rim or mixed into the dough, while others are strewn with sesame or nigella seeds. In a restaurant, you might be served smaller and highly decorated versions of any of these breads, damdy nan. Typically, the plain or seeded version is eaten at breakfast with thick sour cream or butter and fruit jam. Others accompany salads and meat dishes. Whichever variation you are served, it’s clear that these breads are closely related to the Uzbek non or patyr in form and ingredients. 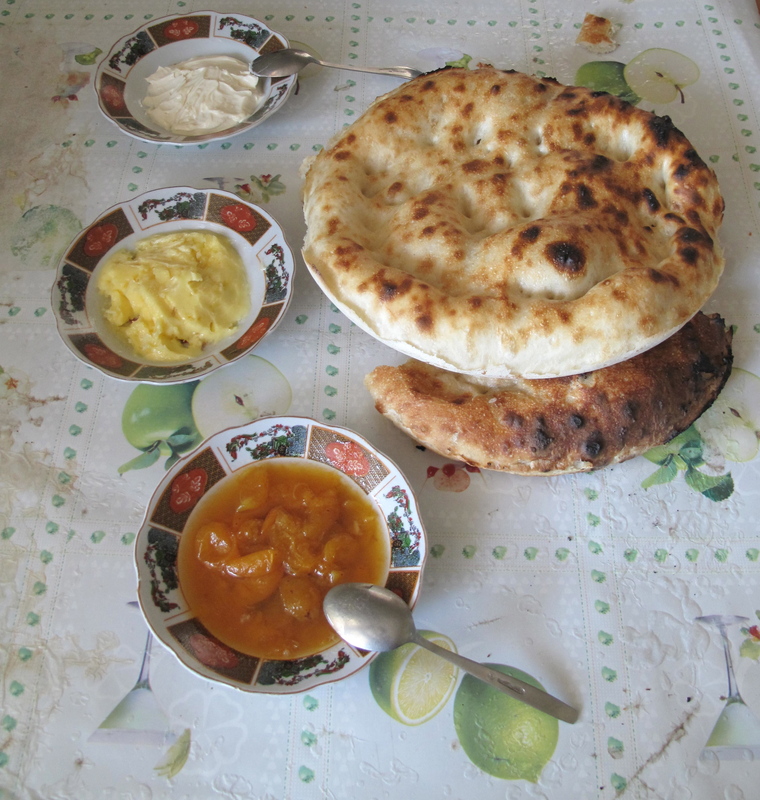 But one of the more interesting things about the Kazakh version is the way they are traditionally baked at home: not in an oven as we might understand it, or a clay tandoor as in Uzbekistan, but in a couple of metal dishes, put together to make a kind of mini oven for each individual bread. Presumably this entirely portable technique is tied to the nomadic roots of the Kazakhs. 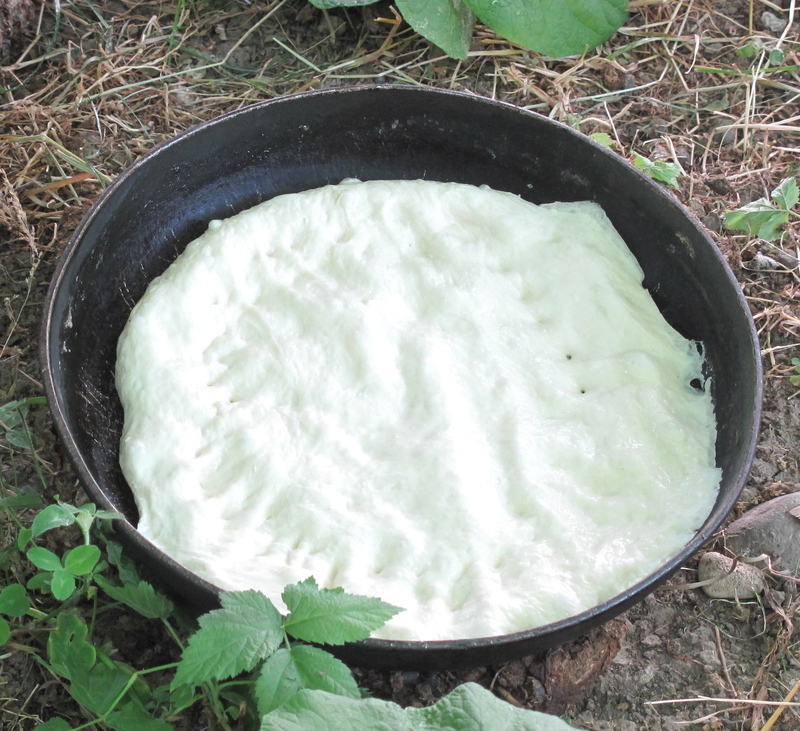 Using it allows anyone to make a perfect bread anywhere it’s possible to light a fire and unhook two pans from your luggage – and produce something that one might more usually asscoiate with a bakery, an oven, and settling in one place. 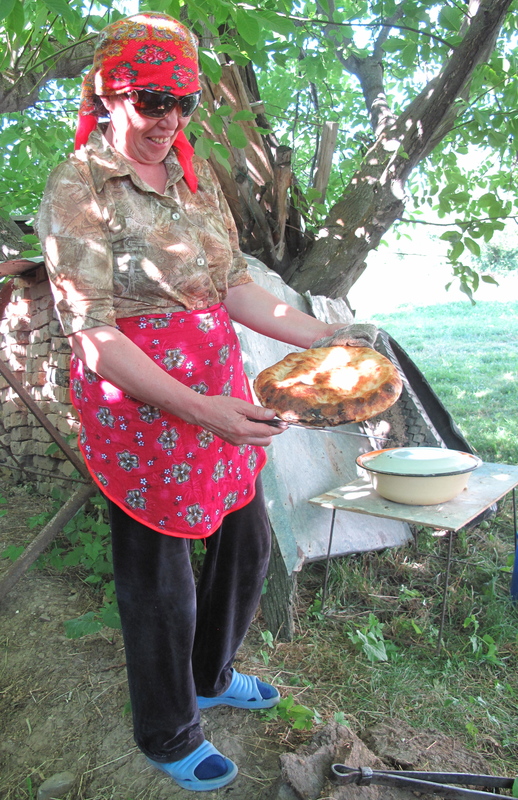 Of course not many Kazakhs live this nomadic life any more, but this only makes it more interesting to find out how people make the bread today. 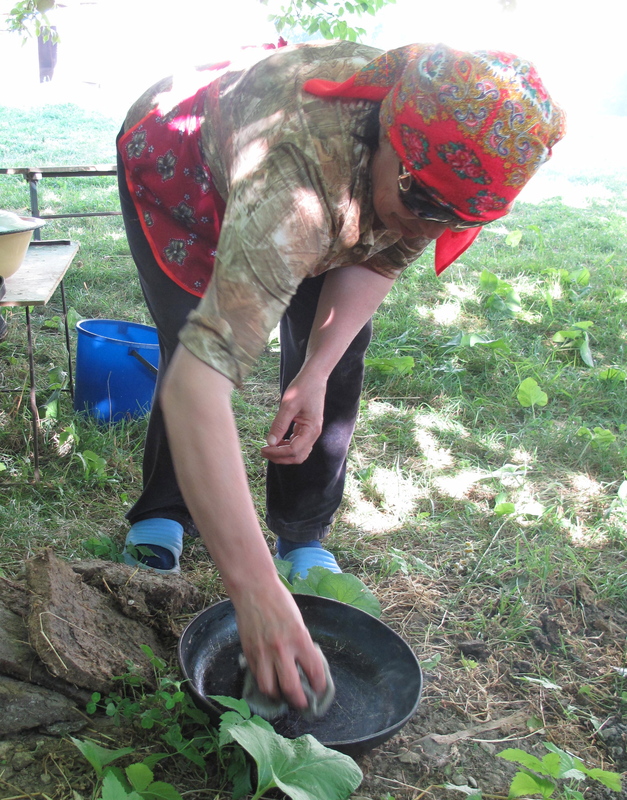 Zubira Boranbayeva showed me how to do it first in the traditional way, on a dung fire; and then in the new way, on an electric stove, when I visited her in the village of Zhabagly in southern Kazakhstan. The different heat sources require slightly different techniques, which in turn subtly affect the flavour of the bread. It was a fascinating example of how recipes and dishes can adapt, and how the small changes and compromises needed to make a recipe work in new circumstances result in tiny but discernible changes in flavour, look and feel. 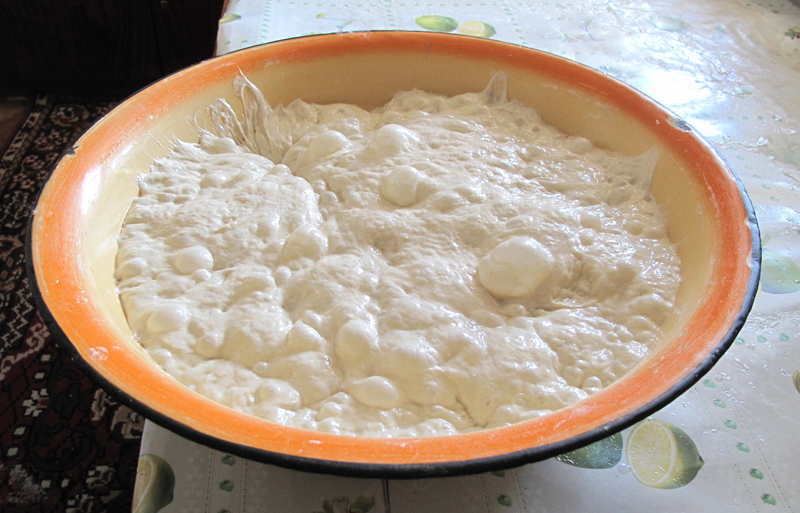 The common factor in both versions is the dough. It’s a very wet, porridgey mixture, generally mixed in the morning and left wrapped up in a warm place for 8-9 hours. Above is the lively result we had to work with! The next step is to light the fire. 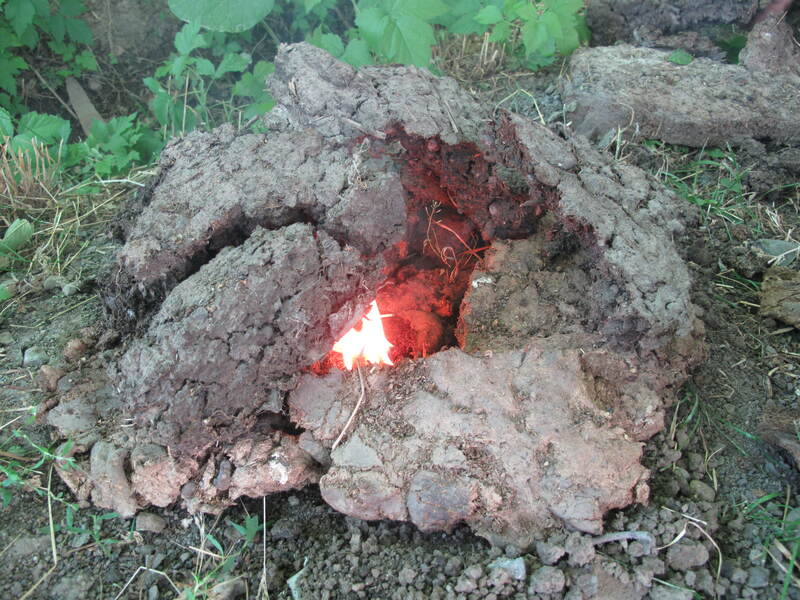 We had a traditionally Kazakh fire made of dried dung, but you could use wood instead. The next step is to heat the pans as the fire takes. 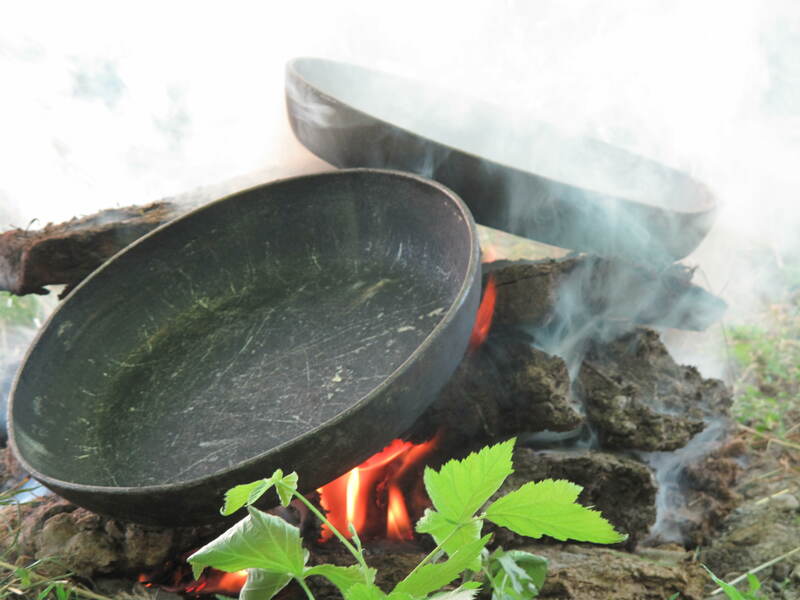 These must be heavy iron pans, safe for use over an open fire, of almost the same size. They need to fit together edge to edge, or with one very slightly smaller than the other fitting just inside the rim of the other. Once heated, the bottom pan should be rubbed with a piece of sheep tail fat to prevent the bread from sticking. Next, take a handful of dough and spread it on the bottom of the greased pan. 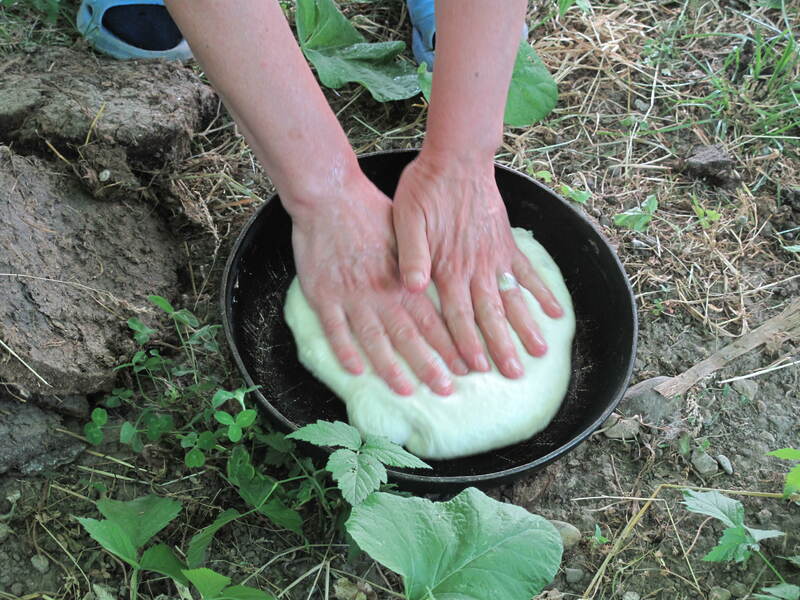 Push it right out to the edges of the pan and make some marks in the surface of the dough with your knuckles. Cover the lower pan containing the dough with the warmed covering pan. Now it’s ready to go into the fire – a large set of tongs is a good idea, as the pans are already hot and will not get any cooler during the baking! Spread out your fire making a good flat bed of glowing embers for your pan to sit on. 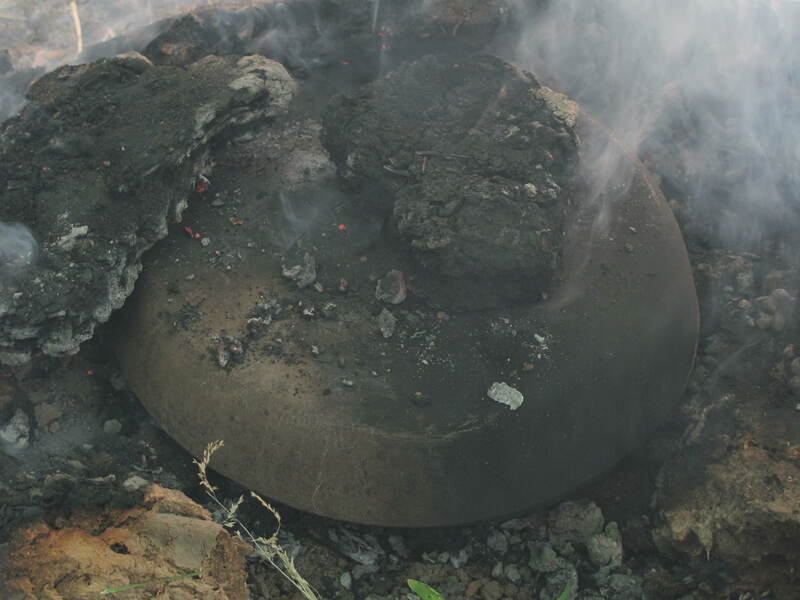 Put your pans in the middle of the fire and cover with some of the smouldering dung (or wood embers). Leave it to cook for about 5 minutes, then sweep everything off the lid, remove the lid, and check whether the bread is done. 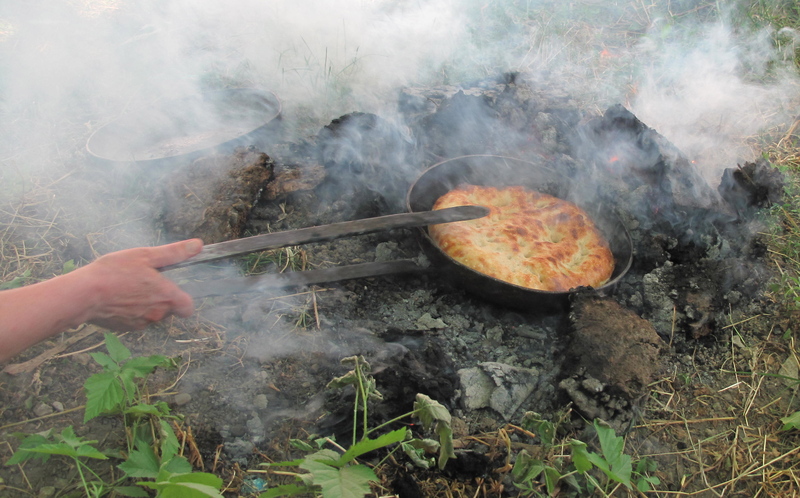 If it is golden on top, pull the pan out of the fire with your tongs and remove the bread. It should tip out easily thanks to the pre-greasing with sheep tail fat. The combination of direct top and bottom heat on a relatively small amount of dough makes this an incredibly quick bread to cook, and the wet dough makes for a light and springy texture. The fat, the smoke and the smell of the outdoors combine to make it an unbelievably delicious one.